Lets your orders move smoothly, whether you opt to ship with USPS, UPS, FedEx, DHL or any other integrated carrier. Compares carriers & services with real-time rate info and gets you the best-discounted shipping rates. Choosing the right carrier means faster & efficient fulfillment, more customer satisfaction, and improved seller ratings. Energizes your business backend by moving more orders in less time with the highest accuracy. Automates most time-consuming and error-prone shipping tasks by applying business rules specific to your orders, organized packing, automated picklists and packing slips creation and real-time shipment processing. Brings total transparency and flexibility into shipping processes adjusted to meet your unique business requirements and gets your orders out faster through the chain with accurate and real-time performance insights. Does Orderhive support integrations with e-commerce platforms? Yes. 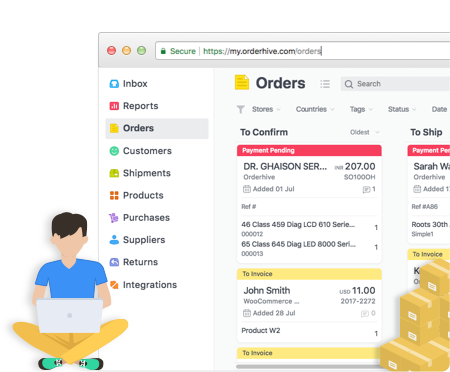 Orderhive is wholesome shipping software that supports built-in integrations with major e-commerce marketplaces like eBay, Amazon, Etsy, storefronts such as Woocommerce, Shopify and more. All you need to do is connect your e-commerce account with Orderhive shipping software and you’re set to go. Then whenever you receive an order from different channels, you can ship them from Orderhive directly. Why should I use Orderhive Shipping Software? With Orderhive as your shipping software, you can fulfill orders smoothly by connecting with more than 40 shipping carriers from USPS, UPS, FedEx, DHL and many more. Orderhive supports integrations with shipping carriers from across the world so you can expand your business’ reach. All new users get built-in integration of USPS and 50% discount for U.S customers only. Orderhive has a shipping rate calculator, to help you manage shipping costs. Does Orderhive provide a demo or trial? Yes! In fact Orderhive both, a trial and demo for its shipping software. You can book a demo, by clicking on the chat icon on our website and speaking to our Product expert. You v\can even get a 15-day free trial. Simply sign up and ready to go. How can I track shipment using a shipping software? A shipping software provides real-time tracking of your shipment. You get a unique tracking number which keeps you updated about the status of your orders and shipments as they move through the supply chain. Can Orderhive automate routine shipping tasks? Orderhive shipping software can automatically manage repetitive shipping tasks. Printing invoices, generating shipping labels, sending notifications, and updating shipping details on online marketplaces can all be done though Orderhive. In Orderhive Plus, the customizable version, users can also add presets for shipping requirements like using one carrier for only deliveries to a specific zip code. Can sellers insure deliveries through Orderhive? Yes, Orderhive shipping software does provide insurance of shipments. Sellers can use the Orderhive Wallet for buying insurance and shipping labels for USPS and insurance for other shipping carriers.